Where does the time fly? 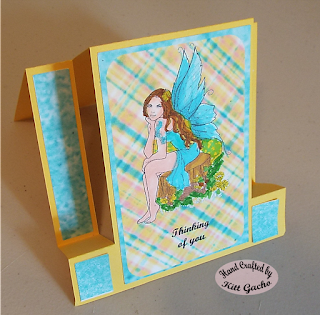 Here is my step card for the challenge over at Give a crafter a cookie. Be sure to stop by and see what the talented DT has for your inspiration today. The image is from SLS Lines. I used Chameleon markers and Zig clear color markers to color. And of course a fairy needs to have some glitter so I used Stickles Diamonds see second picture below. Thanks for stopping by today and leaving your comments I look forward to hearing from you. I will have another 3D project coming soon. I like the Step fold - and that glitter is delicious on her wings! Some fancy fussy cutting going on with this one too! Delighted you are sharing your project and creativity with us at Aud Sentiments! Centre step cards are one of my favourite shapes to make. Im in love with the tartan paper and your colours match it perfectly. Thankyou for sharing with us at Crafting From The Heart. Hugs Valery Anne DT. Nice card. Thank you for sharing with us at 613 Avenue Create. Hope to see you back soon.